Alan Onnen is the Associate Director of Marketing for the Shirley Ryan AbilityLab. Recognized as #1 in rehabilitation for 27 years in a row. AbilityLab introduces its revolutionary care through 5 Innovation Centers - state-of-the-art hospital facilities and equipment for exceptional patient care provided by the best medical and nursing support. 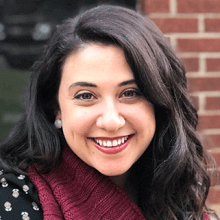 With 15 years of experience in the marketing industry, the past 5 being with SRA and being a part of the team that helped adopt Drupal, Onnen has seen firsthand how Drupal 8 powers digital strategy. Mediacurrent: What does “digital transformation” mean for you? Alan Onnen: Digital transformation means a constant evolution. There’s no single transformation; it’s a constant state of change, staying on top of trends at once. As a digital marketer, you need to know a bit about everything, UI, UX, nerdy stuff, best practices, changes in the digital environment, what people expect from websites in your vertical, etc. Some people think transformation is a binary term - something new - but it's not. Mediacurrent: How does open source fit into the equation? AO: Open source is something that’s not new but it’s getting so mainstream its part of that digital transformation. It’s about adjusting to the new worlds where open source doesn't mean unsecured - it means that it’s open and honest. We had to get buy-in from stakeholders. They dismissed it at the beginning of the RFP because they thought you needed a Sitecore or an Adobe Experience Manager. It took a long time and a lot of agency people to show how safe it is to help make them believe that open source isn’t a dirty word. Mediacurrent: What current challenges are you trying to solve for? AO: It is a constant struggle to keep up with Google - making sure our content is optimized for search algorithms. Our overall challenge is to keep our content fresh, navigating innovative best practices for our website while keeping up with legal and social constructs. Mediacurrent: How are you using Drupal 8 to solve those problems? AO: One of the big reasons we chose Drupal was because of its customization ability. Our knowledge base is spread across so many people so Drupal’s ability to customize the backend experience and offer the fields and plain English way we need to talk about things is really important. Even just the simple need for content creators to be able to edit things and be able to customize that experience. Another big reason was the fact that its open source and the community surrounding Drupal. If you have an idea you can find someone who has half baked or full-baked into that particular module or idea to help give your devs a head start solution. With Drupal, you don’t have to start from scratch when you need something new to move the website forward. Chances are, someone has had a similar idea you can pull from. Mediacurrent: Has this been your first experience with Drupal or have you worked with previous versions of Drupal in the past? 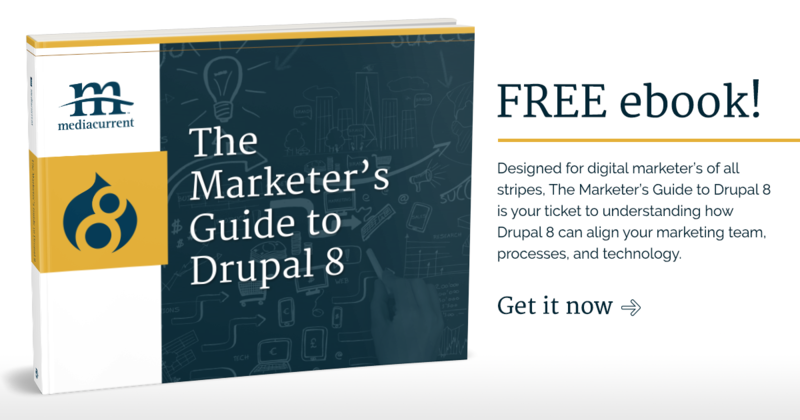 What did Drupal 8 give you from a marketers/content editors perspective? AO: I came to SRA on a proprietary healthcare based CMS. It was designed to serve mid to small hospital systems, and we didn’t have access to the backend part of the site before. SRA put out an RFP for a replatforming and redesign of our website. We talked to different agencies, and Drupal kept coming up - there were no licensing fees with open source. The spin up on Drupal is more robust than most paid CMS experiences. The cost point of view is having it be free and open was very appetizing and Drupal had other features that appealed to us. Mediacurrent: Since launching on Drupal 8 have you noticed an increase in website conversions? What would you attribute to that success (or lack of success)? By use of marketing automation strategies? Because of easy integration? AO: Drupal can be leveraged any which way you want it to be. We take advantage of the extensive list of modules. We have seen nice conversions off the YAML module & the webform module. It’s true of the module philosophy to be able to build how you want them too. With Drupal, our web traffic has been up. We have 3 very different facets of our site - rehab measures database, research educational platform, home site - and Drupal can support them all very well. It’s a testament to Drupal - with a flexible CMS, reporting, user interfaces, and a back end that can be robust enough to bring things together in an organic and seamless way. Mediacurrent: What are 3 factors you look at when evaluating an agency? Cost? Reputation? Their own web design? Logos they've sold? AO: With our RFP out, we began evaluating the superficial - books, examples, case studies, white papers, if their leadership had given talks and what they had talked about, the look and feel for brand consciousness, - exploring that space of ability. We didn’t want someone who was making cookie cutter websites, and we didn’t want to stay looking just in the healthcare vertical. Our list was narrowed down to those whose work we respected and admired. In the RFP, the CMS wasn’t a consideration. We didn’t tell people which platform you needed to be on. We asked for the cost, their preferred CMS and why, and we never cared about where the agency was located. It’s important to know the people are the agency - communication is critical. For instance, in their responses to those RFP’s are there timelines? Are they realistic? Do they make sense? It’s easy to see how much effort they did. No one else did research like you guys [Mediacurrent] did before they got there for a face to face meeting. Your team said “oh, well we’ve already talked to discharge managers, nurses, planners.” They went through example personas, guessing on journeys, patients - and they were smart with how they handled it and took the initiative that early in the process. That showed us a lot about them. It wasn’t a giant new business budget, and they didn’t ask for money up front. In all, the RFP process was about 4 months. Mediacurrent: As a marketer using Drupal, what are some hot topics you'd like to know more about today? Personalization, marketing automation, etc. Mediacurrent: What advice would you give other CMO’s/VP’s/Director’s who are hesitant to move to Drupal 8? AO: I would say it depends on what their hesitation is. You have to be committed to the build of your site. You need to be able to really understand your content creators, the users of your CMS, the scope of what they want to be doing, and understand what they could be doing on the front end. It’s important to know the ingredients - you can muck up Drupal and waste dev hours if you don’t know how the workflows to go and to know your taxonomy and pathing modules. Drupal requires a Digital Marketer to have a vision for what they want it to be before they start developing - or else they risk having to go back and retrofit into their CMS environment that they could have efficiently put in the first time. The journey of CMS and Drupal needs to be a thoughtful one. We want to extend a big THANK YOU to Alan for participating in this interview. In the next part of the blog series, we will dig into the top reasons for Drupal 8 and why enterprise marketers choose Drupal.